What a beautiful day it was for a wedding yesterday. The weather was just perfect! 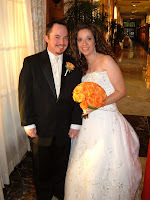 There ceremony took place at St. John Fisher Chapel in Auburn Hills and the reception and The Royal Park Hotel in Rochester. Julie and her Mom Louise came to me last year after seeing me in action at another wedding and hired me to help with the wedding. 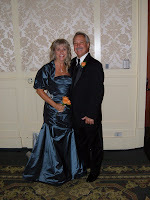 Julie and Steve are such a cute couple and they incorporated a little bit of their careers into the day. They are both librarians and have a great love of books. 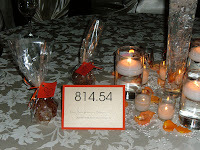 Their seating chart was made by Tifany and Gourmet Invitations and instead of having typical table numbers it had numbers of the Dewey Decimal System. It was great to work with some vendors that I haven't met before. Prem and Cheridy from Arising Images took amazing pics! Don and Joanne were also there filming the day from Take 1 Productions. Once I get the trailer preview of the wedding I will post it on the blog so you brides can check out their work if you are looking for a videographer. Joe from Music Box Productions kept the dancefloor packed all night long...it really was a fabulous party! 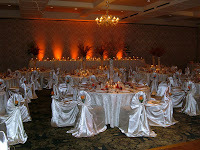 Emerald City Designs did a fantastic job on the decor and lighting. I have to say Louise is one of the most stunning Mother of the Bride that I have seen. She was just as gorgeous and Julie. 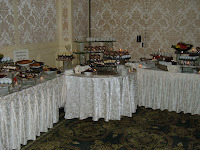 Check out the dessert table and the beautiful cake from Sweet and Savory Bakery. The couple is going to Ireland for their honeymoon how great is that! So now on to the fun part of the wedding planning registering for all those gifts! Even the guy's will love this one. You should register about 4 mos. before the wedding so you have time to make your selections and have your showers. Some of you may not think you will need fine china but someday when you get a little older you will want to start entertaining and you will wish you had registered for it. So my advice is to pick some out and register for at least 12 place settings. 12 might seem like a lot to you but trust me the more you register for the more you will receive and then you can complete your set. Don't forget to select accessory pieces like matching creamer, sugar, butter dish and serving pieces. My favorite pick and suggestion for you brides to register is Bed, Bath and Beyond. There are a few great things about this place that you may or may not know. Your guests can of course use their 20% off coupons on most items. Just flip the back over for the name brand restrictions which are usually Kate Spade, Nautica, etc. If you receive something from your registry and you change your mind about it you can actually take it back and get CASH not a in store credit! They have a great return policy for you brides! As long as the item was on your registy you can get the cash and buy something that you really want or save it for something else. Also, sometimes guests will add items to your registry and although you did not actually register for them again you can take them back if you don't want them and get the cash. I have heard horror stories about the Target Gift Registy so I would not suggest that. Other great places that my clients have registered are Williams-Sonoma and Macy's. Have fun with that scanner and remember if its too overwhelming for one day you can save your selections and return another day to finish the list! I have received announcements from Carlson Craft and Nu-Art and just wanted to let the brides know that they are discontinuing including tissues with orders from now on. Pre-cut tissues were originally used to prevent ink from offsetting on the backs of invitations or other pieces of wedding ensembles. 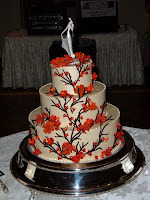 Modern printing processes eliminated this need however following tradition brides continued to use them. Surveys now have shown that the tissues are not being used so they have decided to help the environment and control waste. Sorry for any inconvenience. 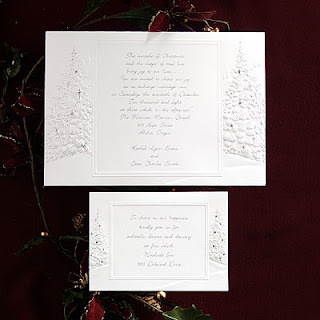 I am sure the other invitation suppliers I use will be making this announcement shortly also. I finally got my new laptop from Dell yesterday..what a relief it was such a pain going to the library everyday! Everything is now set back up and I am getting caught up on my work. The power supply did not work for some reason so they are sending me a new one luckily I can use the one from my old laptop as their universal. If you need help with your computer issues, transferring files over, AOL filing cabinet, favorites, outlook calendar, etc. call Ryan at Platinum Computers he helped me out. He is located in Redford but goes all over Metro Detroit. He has reasonable rates and is super nice. I also bought a new microwave so that is better now too I was getting tired of making my lean cuisines on the stovetop but it worked! The only bad thing was I found out after I got the microwave home that the turntable did not work so I had to haul it back to Sears to exchange it. Not a fun task! So I am praying that the black cloud has left my house so I can function again. Thanks for your patience.